Karwar an excellent beach resort in the Kanara District of Karnataka is at a distance of about518 kms from Bangalore.Karwar was initially a famous town for pepper trade and it was also the settlement of the British and the Portuguese. The Karwar beach is adorned with palm trees and it is known for its pleasant weather and the natural picturesque with hills and valleys of the Western Ghats.This place is famous for its fine muslin. Karwar, the small port town is flanked by the Arabian Sea on one side and the other side with dark thick forest of the Western Ghats. During the reign of the British in 1862 Karwar was the headquarters and it was the prime centre for sea trade. The Arabs, Dutch, Portuguese, French and British had trade in India via Karwar.This port was considered to be very safe and the Arabs who had trade in India called it as “ Baithkhol “ meaning bay of safety. Many Indian commodities were exported to foreign countries were brought from the Deccan by routes as this port was considered safe during all seasons.Karwar is flanked by five other islands safeguarding the fort and they are Anjidiv, Kudumgad, Dev gad, Mogral and Shamshigudda. Yathra - This is one of the annual festivals celebrated in Kurumgad Island of Karwar.During this festival people have merry ride in the ferry boat to the island which is just a kilometer from Devbagh beach.Yathra festival falls in the month of January. Karavali Utsav - This is one of the major utsav happening in Karwar and it is more of a cultural festival. 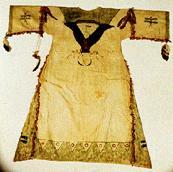 It takes place in the Rabindranath Tagore beach and lasts for four days. The festival is highlighted by many shops and stalls and cultural programmers are held where people from different parts of the state participate. Ramzan Id - It is a major celebration of the Muslim community which marks the end of Ramzan during which people fast by day and eat only at night. Other major celebrations of Karwar include the common festivals celebrated in the country like Ganesh chaturthi, Diwali and Shivrathri.These festivals are celebrated with great fun and enthusiasm. This is one of the famous pilgrimage spot of Karwar and is located at a distance of about 56kms from Karwar.Gokarna houses the famous Mahabaleswar Temple which has the idol of Lord Shiva and a huge chariot. 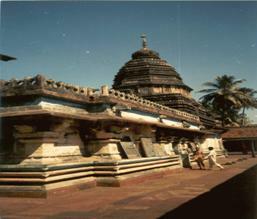 It is famous for the ‘Atmalinga’ which is second only to Vishwanatha Temple at Varnasi in North India. The chariot is taken out in a procession at the time of Shivrathri.The other places of interest here includes, the beaches of Kutle, Om, Half moon, Paradise etc..
Naganatha Temple in the city of Karwar is one of the must tourist destinations. The interesting feature of this temple is that an anthill is worshipped here. This island houses the famous Narasimha shrine of Karwar and the deity worshipped here is Lord Narasimhan.The Island also has the remains of a ruined old fort. History says that this temple town Banavasi is mentioned in the epics like Ramayana and the Mahabharata. It is situated on the banks of the Varada river which is at a distance of about 140 kms from Karwar.Other places of interest to be visited in Banavasi includes Madhukeswara temple, the ruins of a Buddhist stupa, the Veerabhadra temple and the several idols and the Jain icons. 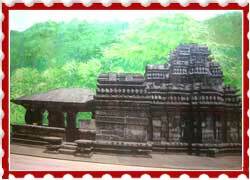 Ankola, a small town situated at a distance of about 37kms from Karwar.You can get to see the ruined walls of the fort built during the reign of king Sarpamalika.It also has the Venketaraman Temple along with two giant wooden chariots carved with scenes from the 'Ramayana'. 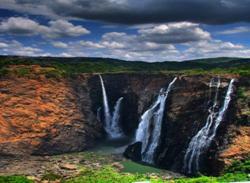 This is considered to be as one of the beautiful and highest waterfall in the world. The source of this water fall is from the river Sharavathy which splits into two as it pours down and it is called as Raja, Rani, Rocket and Roarer.It comes under the limits of Shimoga district and is at a distance of about 380 kms from Bangalore. This is small island which is very close to Karwar.Devbagh Beach Resort is famous for adventurous water sports like diving and skiing. 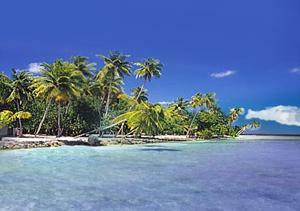 The resort here is an ideal place to relax from the worldly tensions. 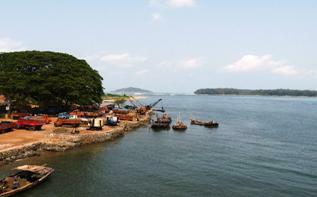 Karwar Harbour is very famous for it is one of the natural harbours in the country. Beaches close to this harbour are Binaga and Arga which should never be missed. The River Kali which flows through Karwar is a famous tourist location. 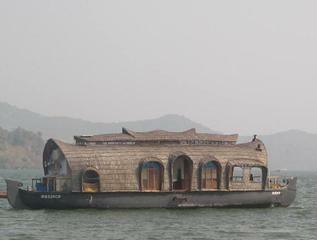 It entertains the people by having boat rides. It is a picnic spot for weekends. 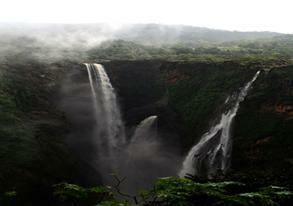 Dandeli is not only known for its holiday resorts but it is also a famous industrial township. This town also accommodates a wildlife sanctuary spread over an area of 207Sq. Kms where you can get to see rare variety of animals. This town is specialized in paper, plywood, teakwood and Ferro-manganese factories. Dandeli is located 93 kms from Karwar. Lushington Falls is also known as Keppa falls and is situated in Siddhapur which is at a distance of about 110kms from Karwar. The falls where the river Aghanashini thunders down from the height of 116 meters is named after a District Collector who discovered it in 1845. The Magod is 125 kms from Karwar.The river Gangavathi emerging from the Western ghats takes a leap into a chasm of 600 feet down, in a series of cascades over the cliffs presenting an enchanting sight. The nearest airport is situated at Leh. The nearest railway station is located at Jammu, about 739 kms. from Leh. Kargil is situated about 204 kms from Srinagar and 234 kms from Leh.